This name is of Northern English locational origin from any of the places in Cumbria and Yorkshire thus called. Recorded variously as Braythwayt and Braythweit in late 13th Century records of the above countries, the derivation in all cases is from the Olde Norse "breithr" meaning broad, plus "thweit", a cleared area; hence, "broad cleared piece of land". The surname is first recorded in the early 14th Century (see below). One Willelmus de Brathwayt appears in the 1379 Poll Tax Returns Records of Yorkshire. 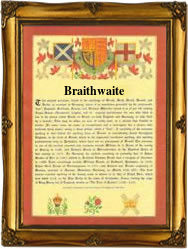 The name, with variant spellings Braithwait and Bratwait, is particularly well recorded in Yorkshire Church Registers from the mid 16th Century. On June 11th 1542, Agnes Braithwaite and Henry Wood were married in Wensley parish. John Braithwaite (1797 - 1870) was engineer-in-chief to the Eastern Counties railway, 1836 - 1843, and joint-founder of the "Railway Times", 1837. A Coat of Arms granted to the Braithwaite family of Lancashire is a red shield with three black crosses crosslet fitchee on a silver chevron, the Crest being a silver greyhound couchant, collared and chained red. The first recorded spelling of the family name is shown to be that of Adam de Braythwayt, which was dated 1301, in the "Subsidy Rolls of Yorkshire", during the reign of King Edward 1, known as "The Hammer of the Scots", 1272 - 1307. Surnames became necessary when governments introduced personal taxation. In England this was known as Poll Tax. Throughout the centuries, surnames in every country have continued to "develop" often leading to astonishing variants of the original spelling.